an Armstrong transom bracket with twin yamaha outboards"
Transom brackets extend the length of the hull below the waterline paying big dividends in stronger performance, lower fuel consumption, a drier ride and improved handling manners. Beyond heightening performance and improving handling manners, brackets lend other significant improvements. 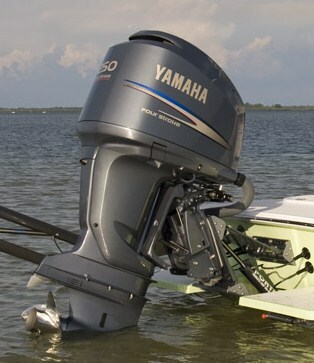 Mounting the outboard motor further aft eliminates the transom cutout, paying big dividends when backing down on a fish, or when running in following seas. Transom brackets allow tilting the outboard motor completely up and out of the water, thereby protecting aluminum castings and the propeller from the ravages of corrosion. Some brackets even include flotation in their construction, which raises the stern and keeps the cockpit drier. Another benefit of hanging the outboard motor off in thin air, (as opposed to snug up against the transom) is greater cockpit space. What was formerly the outboard motor well becomes the cockpit sole. Many top line boat builders install transom brackets on the factory floor, right alongside the cleats, bilge pump and rocket launchers. Examples are Jupiter, Angler and Regulator, to name a few. It is also common practice to retrofit older boats. Grafting transom brackets onto inboard and stern drive boats with worn-out engines pays off in higher performance and improved handling while burning less fuel. A cautionary note: Outboard motor transom bracket installation is too complex a procedure to be undertaken by the average do-it-yourselfer. For example, moving an engine aft alters the center of gravity, and therefore, balance and handling. To compensate, experts usually re-locate the fuel tank forward. For the amateur boat-builder, the question is, exactly how far forward? Also, for obvious reasons, fuel tank installation is a job best left to the pros. Obviously, rigging high horsepower engines is a serious matter. So much so that Suzuki Marine voids the warranty on any of its outboard motors sold un-mounted. Then there is the matter of the structural integrity of the transom. Dry rot is notorious for turning plywood core material soft. Soft means weak. Hanging hundreds of pounds of outboard motor and bracket off an aged transom tempts catastrophic failure. Another complication could occur due to the inexperienced Boatwright while drilling bracket mounting holes into the transom: if not properly sealed, core material is exposed to moisture and eventual decay. Conversely, a professional installer knows exactly how to fill in a stern drive cutout and how to repair or restore a weakened transom. The net result of a professional installation is a transom and bracket assembly that will not leave you nervously looking over your shoulder to see whether the twin 200s have taken a hop, skip and a jump down to Davie Jones Locker. Even better than the good news about what transom brackets can do for performance is the wide array of companies that build transom brackets for outboard powered boats and the wide variation in features and benefits. For example the Porta Transom Bracket is unique in that it is hydraulic and can accommodate from one to five maximum horsepower V8 or V6 outboard motors. Hydraulics allow the engine to be completely tilted out of the water. Because motor height is adjustable, the helmsman can fine-tune propeller depth for fast flying or shallow running on flats. Armstrong Nautical Products offers a line of custom-designed, high performance outboard brackets. Most noteworthy features include flotation that lends the hull greater buoyancy and eliminates back spray that might otherwise wet the cockpit. Access plates are watertight. And finally, Stainless Marine offers a full line of outboard transom brackets for single and multiple engine installations and custom fabricates to order. Optional positive flotation can be added to any of its models. More usable space inside your boat. Easier access to the water. Boat performs like a larger craft. Drier backing down on fish. 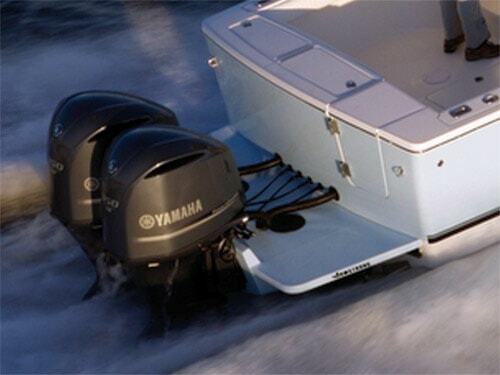 Convenience of outboards combined with the safety of a full transom.